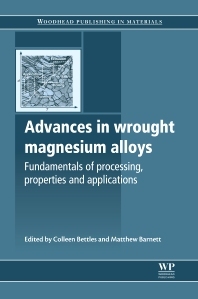 This important book summarises the wealth of recent research on our understanding of process-property relationships in wrought magnesium alloys and the way this understanding can be used to develop a new generation of alloys for high-performance applications. After an introductory overview of current developments in wrought magnesium alloys, part one reviews fundamental aspects of deformation behaviour. These chapters are the building blocks for the optimisation of processing steps covered in part two, which discusses casting, extrusion, rolling and forging technologies. The concluding chapters cover applications of wrought magnesium alloys in automotive and biomedical engineering. With its distinguished editors, and drawing on the work of leading experts in the field, Advances in wrought magnesium alloys is a standard reference for those researching, manufacturing and using these alloys. Practitioners in magnesium alloy material science and those working in the technology and application/manufacturing fields. Colleen Bettles is Assistant Director of the ARC Centre of Excellence for Design in Light Metals at Monash University. Matthew Barnett is ARC Future Fellow and Professor of Metallurgy at Deakin University. Both are internationally-renowned for their research in magnesium alloys.